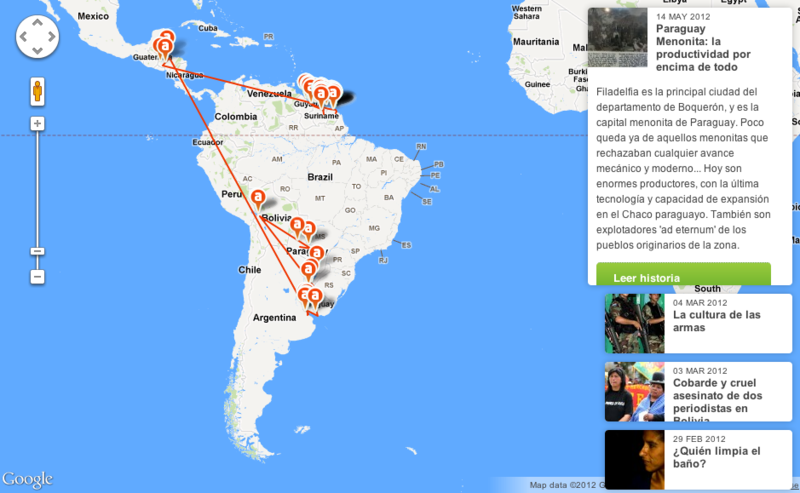 Since August 15, 2011, readers of the Blog de la Ruta  (The Route's Blog) [es] have been traveling Latin America through the stories told by bloggers from the website Otramérica. The team behind Otramérica  [es], a nonprofit initiative from Human Rights Everywhere , decided to enlist bloggers to tell stories “from the ground” while they traveled through little-known places in Latin America. Contar las realidades que suelen pasar inadvertidas o que son invisibles para la mayoría de los medios de comunicación industriales; y enredar (en redes) a personas, movimientos y organizaciones en esta tarea de desenredar la vida para entenderla y transformarla. To tell readers about the realities that tend to go unnoticed or that are invisible in the majority of industrial media; and connect (through networks) people, movements and organizations in this task of unraveling life in order to understand it and transform it. Paco Gómez Nadal  [es], a well-known Spanish journalist who has covered Latin America extensively, launched the blog and the journey. He started by introducing readers to The Guianas  in several posts  [es] before his first stop in Cayenne , French Guiana . In his next stop, Suriname , Paco writes about the capital city  [es] (Paramaribo ), the country's problem  [es] with gold  [es], old and new forms of slavery  [es], gay rights  [es] (see video, in English, below), and more  [es]. The journey was interrupted  [es] in September 2011 after a brief stop in Guyana  [es]. 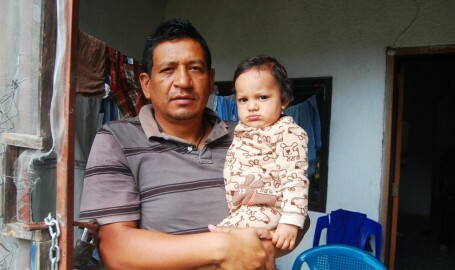 But a month later journalist Victor Alejandro Mojica picked up the blog with a trip  [es] to Honduras and Guatemala. Este Honduras ni se escucha, ni se conoce, es invisible al mundo occidental. Y aquí, donde parece que la tierra lo es todo, es donde ocurren las violaciones menos éticas. Porque los recursos naturales, aunque parezcan de ellos, están vendiéndose a capitales sin pudor. This Honduras or is neither heard, nor known, it is invisible to the Western world. And here, where land seems to be everything, is where least ethical violations occur. Because natural resources, even if it seems like they belong to them, are shamelessly being sold to businesses. Salvador Zúñiga, an "indignado" of Intibucá. Photo by Victor Alejandro Mojica, used with permission from Otramérica. The blog welcomed a new contributor, Solange González Henott, in early 2012. Solange began her trip through South America's “Southern Cone” (Chile, Argentina, Uruguay, and Paraguay) with a story about an attempted escape by inmates in a Chilean  [es] jail. In Argentina, Solange describes what summer  [es] is like in Buenos Aires, and visits a villa (a marginalized urban settlement), where she meets two women who migrated  [es] to the Argentine capital from Bolivia and Paraguay. In Montevideo, Uruguay, Solange introduces readers to Llamadas  [es], carnival parades that take place every summer. She also talks to unionized  [es] sugarcane workers about their triumphs and struggles. In neighboring Paraguay, Solange writes about “the king of Soy ” and the country's “gun culture ” [es]. During a stop in Bolivia, Solange blogs about the “cowardly and cruel murder” of two journalists  [es] in El Alto. She then describes the Aymara indigenous tradition of “ajtapi ” [es], a communal meal. 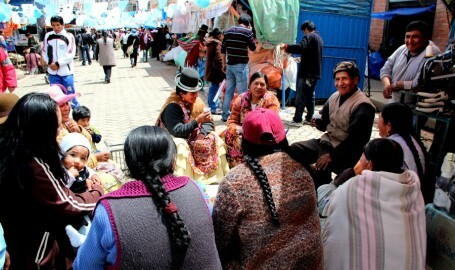 Ajtapi in El Alto, Bolivia. Photo by Solange González Henott, used with permission from Otramérica. Paco Gómez Nadal returns to the ‘Blog de la Ruta’ to write about his experience in Mexico  [es] during March 2012. There, he blogs about the complexities  [es] of violence and death. He also looks at the current state of the Movement for Peace with Justice and Dignity  [es] and its leader, Javier Sicilia [es]. In May 2012, Pedro González del Campo became to blog's latest contributor, covering Latin America's “low lands”  [es], tierras bajas in Spanish: the places that have been most marginalized by the powerful and by history. El Chaco es una ecoregión extensa que alberga hasta 3 ecosistemas diferentes y en el que viven de manera tradicional muchas personas que ven cómo la ganadería acaba con su medio, en el cual se sienten integrados como seres que habitan este planeta. Si nadie lo remedia, su destino es la desaparición y la pérdida de biodiversidad y biomasa que hará de este planeta un lugar menos habitable, además de la escandalosa degradación a nivel social que esto implica para sus pobladores. The Chaco is a vast ecoregion that holds up to 3 distinct ecosystems, where many people who live in a traditional way are seeing how cattle raising destroys their environment, where they feel integrated as beings who inhabit this planet. If no one fixes this, the destiny of the Chaco is disappearance and loss of biodiversity and biomass which will make this a less habitable planet, on top of the outrageous social degradation that this implies for its residents. 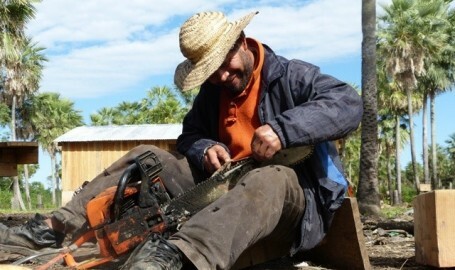 Sharpening a saw to build a house in a ranch in the Chaco. Photo by Pedro González del Campo, used with permission from Otramérica. Almost a year after the start of this journey, Pedro's trip through Latin America's “low lands” has just begun. Blog de la Ruta provides a glimpse into the continent's varied and complex reality. You can keep up with the journey and read previous entries in the Otramérica website  [es]. Featured image from Otramérica , used with permission.